This composite photo shows three of the British army's new recruitment ads targeting millennials. 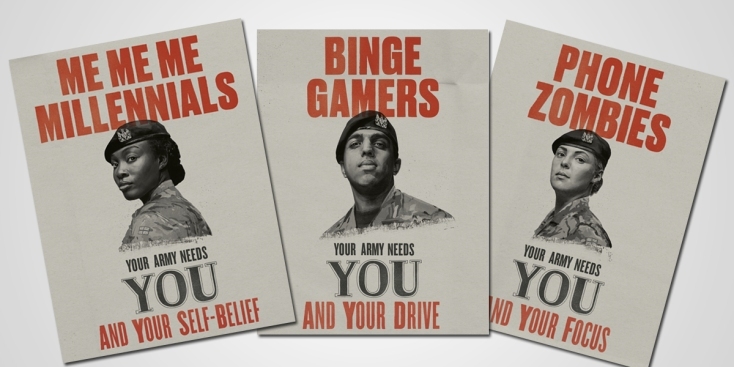 "Snowflakes," "phone zombies," "binge gamers" and "me me me millennials" are the focus of the British army's latest recruitment campaign, NBC News reported. Posters and billboards reminiscent of the famous World War I "Your Country Needs You" ads have been given a 21st-century twist, sending the message: "The army spots potential. Even if others don't." The U.K. has struggled to maintain its target of 82,000 troops in recent years due to a declining number of recruits. The new ads appear to attempt to engage millennials by connecting the stereotype of the screen-addicted generation with desirable skills. "Phone zombies" are wanted for their focus and "binge gamers" for their drive. "We are trying to show that we are unlocking potential — potential that many elements of society may not see in young people, but we do," Col. Ben Wilde, head of recruiting for the British Army, told journalists at a press briefing on the initiative Thursday.